Brigyn play the music and Arfon Haines Davies is the auctioneer in this 10 November 2017 fundraising art auction at Llanofer Hall to raise money for the 2018 Eisteddfod Caerdydd. £10 gets you entry, a glass of wine and free after-show entry to the Cameo Club in Pontcanna. Pwyllgor Apel Pontcanna sy’n trefnu. Here are some photos taken in Llandaf Fields, Pontcanna Fields and Bute Park showing some of the vivid yellows and reds of autumn starting to bleed through on the leaves of the parks’ trees. 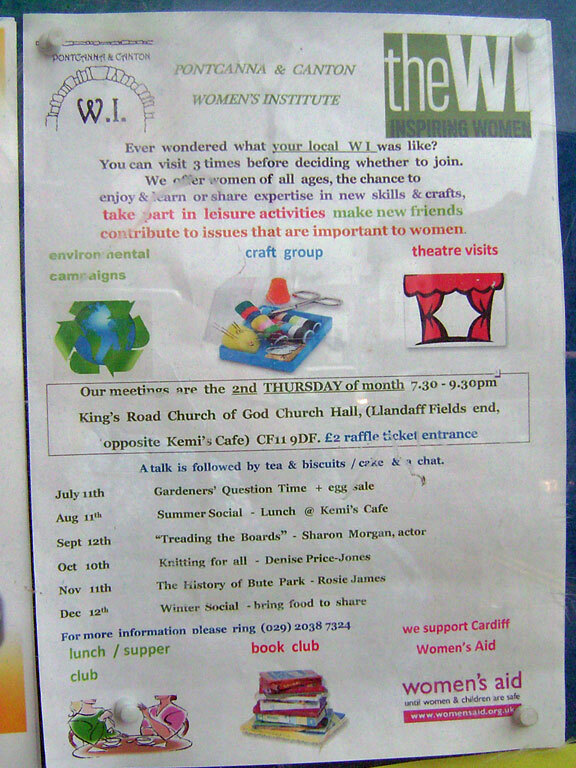 The Pontcanna and Canton branch of the WI is recruiting new members. The group meets on the second Thursday of most months at the King’s Rd Church of God Church Hall. Forthcoming meetings will be about acting, knitting and local history. There are contact details on the poster below.